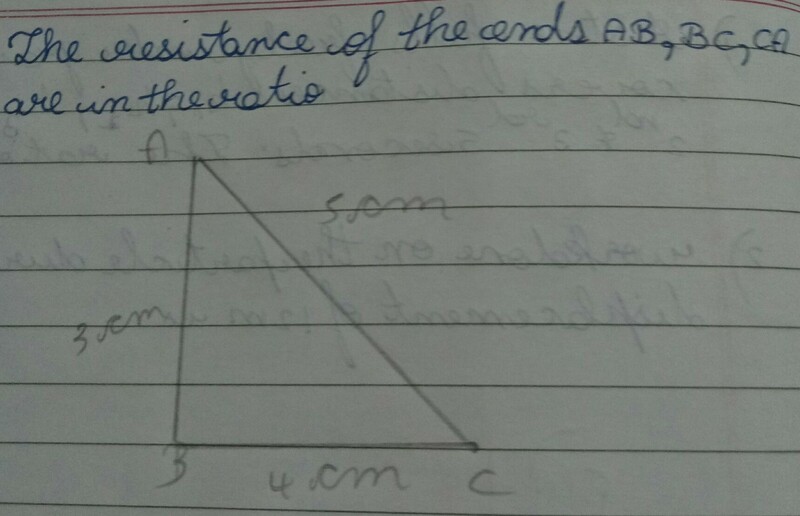 I think the ratio of  Resistances of AB:BC:CA  might be 3: 4: 5.As resistance is directly proportional to the length of the wire . Sorry Poonam, you forgot to consider those segment which are in parallel to each individual segment. To answer such question, always remember to evaluate the effective resistance for each and every segment. DO YOU TEACH ELSEWHERE WITHOUT ONLINE COACHING PERHAPS IN DELHI. WHICH IS THE BEST REFRENCE BOOK FOR CLASS 10 SCIENCE , MATHS , SST.